So, this is a pic of what I'm calling our "Garden of Neglect." Back in April (the week before we got the offer and acceptance on the house), the kids and I threw out a few seeds. Then, we did nothing. Really. We've not watered. We've not weeded (obviously). We've not sprayed any organic pest control. We've not fertilized. And, still, it grows. It's kind of like it's mocking me really for all the hard work I've put into it in seasons past. Rather than feel lazy about it, I've decided to tell myself that it's an experiment in gardening that's meant to benefit both me and you, my blog readers. I'm finding out what varieties grow best with little or no maintenance. 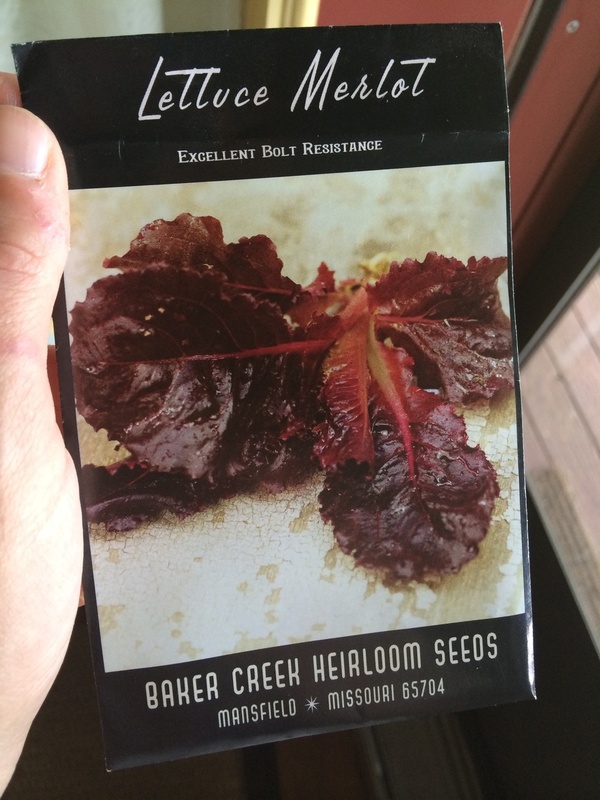 So far, my best pick for lettuce in the lazy man's garden is this Lettuce Merlot from Baker Creek Seeds. See that purple lettuce? Isn't it gorgeous? It's mid-June now, and it has yet to bolt. It has a great mild flavor. And, it has thus far experienced zero pest damage, making it a great variety for an organic bed. Here, you can see that the green variety next to it has suffered some insect damage, but the purple remains untouched. So, go grab your Garden Planner and make a note for 2015's garden. There are lots of great reasons that this a variety you should include. Plus, salads are just prettier with a little red thrown in the mix!